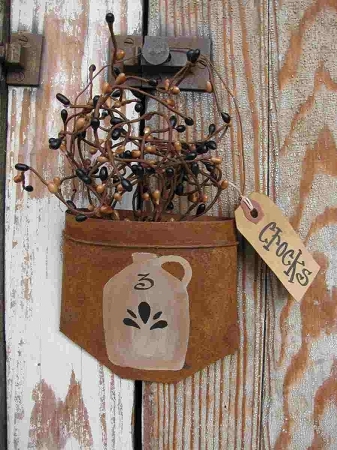 Primitive hand painted stoneware crock jug on a rusty tin hanging pocket. We love our hanging pockets and we try to come up with new ones. I personally love stoneware crocks, have them all over our house. What a great little accent piece this would be. Rusty metal pocket with wire hanger. Jug painted on and a primitive tag added to the side and filled with pip berries. You can choose your saying from the list of options. Shown with crocks. Size is 5"x5". Hand painted, designed and signed by Heidi.